Innovations do not come about just like that. They are the result of many years of research, comprehensive practical experience, and last but not least the will to always think ahead a little further and to keep future developments in mind all the time. Teroson has been meeting these challenges for many years and has developed products and system solutions that do not simply follow current trends, but set them, in the original equipment manufacturing and in the repair shop sector. 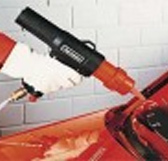 Teroson automotive body repair products allow vehicle body repairs, conservation and additional protection that add factory-quality finish to every job.